Marseille's public transport is quite useful, from the airport bus to the Métro, tram and bus lines, but watch out for pickpockets! L'aéroport Marseille Provence (MRS) is at Marignane, 26 km (16 miles) northwest of the center of Marseille, reachable by airport bus, train and car. 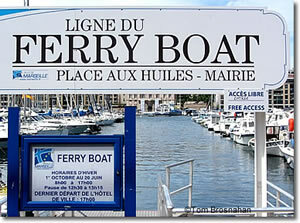 You can take a navette (shuttle) from the airport's quai no. 2 to the Vitrolles-Aéroport SNCF train station to board trains to Marseille, Aix-en-Provence or points north such as Paris. The shuttle departs the airport about 10 minutes before train arrival time. The train trip into Marseille takes about 20 minutes and costs5.10€. L'aéroport Marseille Provence is also the main airport for travelers to and from Aix-en-Provence. 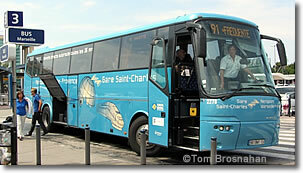 Cartreize Ligne 40airport shuttle buses depart the airport every 15 minutes for Aix. The Gare de Marseille Saint-Charles SNCF, 24 km (15 miles) southeast of the Aéroport Marseille Provence and just over 1 kilometer (6/10 mile) northeast of the Vieux Port, is Marseille's city-center train station. Métro, tram, city bus and airport shuttle bus lines connect the station to the rest of the city. Marseille's Gare Routière (bus terminal) is o the north side of the Gare Saint-Charles (Rue Jacques Bory; map), with buses to nearby cities and towns in the region. RTM Bus 82S to the Vieux Port also departs from here. Marseille's other important train station is Blancarde, 3 km (2 miles) east of the Gare Saint-Charles (map) on the line to Cassis and Toulon. 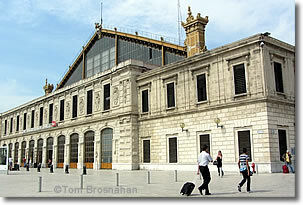 However, Gare Saint-Charles is nearer to the city center, and is the station you're most likely to use. Marseille public transport is by Métro, tram and city bus operated by Régie des Transports Métropolitains. Click here to download a plan (map; 1.1MB) of the transport network in the city center. The Marseille Métro has two lines. Métro Line 1 connects Gare de Marseille Saint-Charles with the Vieux Port and Hôtel de Ville. Marseille's three tram lines are not particularly useful for short-term visitors interested in sightseeing. 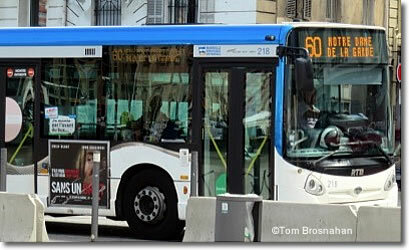 City buses are quite useful on a few routes, especially Bus 82S from the Gare Saint-Charles to the Vieux Port, and Bus 60 from the Vieux Port to the hilltop Notre-Dame de la Garde. You can buy a solo secours ticket right on the bus for 2€, though it's cheaper if you buy a TransTick (10 centimes + 1.70€ fare = 1.80€). You can recharge the TransTick two times for later rides at 1.70€ each. Beware of Pickpockets on Bus 60! NOTE! Bus 60 is a favorite with pickpockets! They know that lots of tourists use the bus to climb the hill to the Notre-Dame de la Garde church, so they lurk at the Vieux Port bus stops, looking at foreigners' pockets and handbags. On the ride up the twisting road to the church, standees must hold on with both hands. 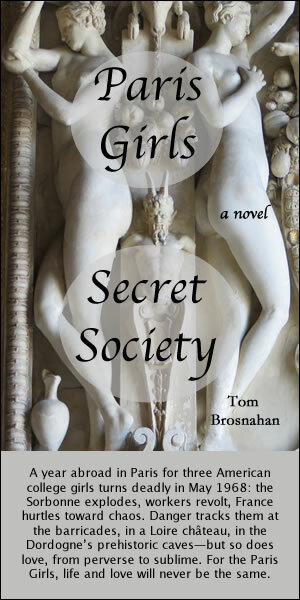 The thieves create a diversion—a commotion of shouting, for example—and in that moment your valuables disappear. You will feel nothing! Bus 60, Marseille: beware of pickpockets! If you are able to take a seat on the bus you are relatively safe, but if you are standing for the ride, secure your valuables, preferably in a neck or waist pouch under your clothing. Rental/hire car stations are in front of the airport. Use the handy Car Hire Search Box on the right to search all the car companies for the best deal from Aéroport Marseille Provence. As with all French cities, car parking lots are indicated by signs throughout the city, indicating how many places are available, or if the car park is complet (full). Marseille Airport Bus 091, at Quai No. 3: every 15 minutes to Gare de Marseille Saint-Charles. Gare de Marseille Saint-Charles SNCF.